Next week at a Trimarian event called “Corsair’s Heart”, Mistress Mayken van der Alst is coordinating a Medieval Hike! I decided that this sounded more in my wheelhouse than an entry into the Birka Garb Challenge, so I chose to go full bore and see what I could come up with. The short answer: A middle/working class Byzantine ensemble that would be comfortable for hiking in. The hilarious thing is that I don’t own anything lower class, or uh, casual. But for real, in period, in persona, I would have been carried to Jerusalem in a litter, or rode in the back of a carriage. If I was “roughing it”, I would be on my own horse. Walking? Bah! But that’s not the point of this exercise. The point is to walk, and wear and carry something that I could walk in, comfortably. Better start at the bottom. Layer that is. In my searching for *sigh* casual Byzantine, which, by the way, not that easy, I found a Cappadocian fresco that is contemporary to my period. Here, a midwife and Salome bathe the infant Jesus and his rippling man-pecks of the Divine. Fresco is located in the Dark Church, Goreme, Cappadocia. 11th Century. Hot diggity, they’re tied behind her back! I determined it was either one of two things: A guard that was slung over the shoulders to allow her to pull her clothing back and away for midwifery duties, or, slits in a tunic designed to do this, again, for her profession. Both are plausible, of course, but I decided to test the theory on a tunic, as it’s also supported by some of the work Dr. Timothy Dawson has done with kavadion/gambesons whereas the underarm is open, and the padded long sleeve can be pinned back for more movement. The base pattern for the esoforion (undershirt), is the Manazan Caves Tunic, which I’ve used before for some shirts for the hubby here. The reasons I decided to go forward with one of these for myself were: A; The high collar is good for protecting against the elements. B: The extant tunic is contemporary to Cappadocia, but not in the same location. The Manazan Caves are in present day Karaman, Turkey, and the Dark Church is in present day Goreme. This is a distance of about 270km. That doesn’t mean that these settlements weren’t in contact, and it’s still close enough for approximation of Cappadocian fashion. C: The long gore construction of the Manazan find would work well with allowing a ton of ease and slack on the arms for slits in the sleeves. So, with my pile of 3.5oz natural linen, I set off on an adventure. I determined that the sleeves would have to be longer to pull this off, but since that was a Persian trend that had trickled into Byzantine fashion and stayed, I had no qualms with some potentially droopy sleeves. I also ended up hand-sewing the entire collar, and all openings/hems. There are only 6 machine sewn seams in the whole thing, not bad. I do want to do an entirely hand-sewn one of these, and I have the fabric to do it, so I figured this would be good practice. Plus, as I mentioned in my previous blog post about this tunic, hand sewing the collar construction is a must, anyway. It just won’t work right with a machine. Good thing too, because after the couple days it took me to complete the collar setup, I returned to the machine, and promptly sewed a full stitch through my left index finger, INCLUDING THE NAIL. Typing hurts right now, but it’s healing. I guess that’s a sign I should keep on my hand work practice. So much whipstitching, man. The Byzantines loved them some whipstitch. Tacking down the inside facing. Seeing the hand stitching on the outside. Putting the placket over the front. Whipstitching the whole darn hem! I usually use a blind hem stitch, but it’s really not accurate. I decided on the arm slit placement after basting the side seams together, and looking at fit. Each slit is 8″ out of the front seam that connects the gore. I then cut the basting, turned in a hem, and it was done. Zero fuss, and zero fabric waste or odd cuts into the garment. The pictures speak for themselves. It works. The placement of the uber-long gore makes for a full range of movement, and as you can see, I can still create more slack to go over an outer tunic. This garment is more than practical for just midwifery. While on pilgrimage, it would be beneficial to cover your skin for sun protection, and the long sleeves still allow for this. But, if I get too hot, or need to cook/set camp/do dirty work, I can tie my sleeves back and be comfortable doing so. Genius. I’m going to use a tie on the front of the collar this time, versus a button and loop as I did for Gieffrei, because I feel it will allow me to adjust fit and function better during the hike. I can inkle weave a small band easy enough in an hour on my little loom. Of course, the outer garment is next after that. I’m following through with the color scheme of the fresco, especially the look that Salome is wearing on the right. I have a block printed cotton I will be using for the turban to match the Cappadocian look, as well. My final touches will be a shoulder bag, and a relic bag for my belt. If I can find out more, I want to research into accurate ankle support as well, only because I’m a chronic sprainer and could use the, uh, help. These will all be completed over the course of the next week, and I’m looking forward to pulling it all together for the hike! “Protect ya neck!” Or, how Anna learned to hide Gieffrei’s delicate collarbones. My husband has a huge head and a normal neck. Those of us who sew know what this means, it means a gaping maw of a neckline that shows off the Norman’s delicate ginger skin. And while it’s nothing a nice brooch and a gallon of sunblock can’t fix, it’s not -right-. I’ll be posting soonish on dressing my husband in Byzantine, (yes, really, men’s garb, you heard it hear first), as well as including a new page on Norman Garb here on my site (*faints*) but I needed to reassess my approach toward fit. During my short time in Caid, I had a discussion with a friend about necklines. American reenactors and re-creators make our necklines too big. After her visit to Scandinavia and meeting with Viking reenactors in the land of Where This Stuff Actually Happened, she gave me some tips on how to fix my stupidity. I’m sure that this technique is known to a few people and I’m going to get a “WELL, DUH!” Gibbs Slap in the comments, but knowing also that there’s some derpy sewers out there who probably make the same mistakes I do, this post is important. For the longest time, I’ve been following a formula given to me a while ago: You draw your neckline 3-4″ each way from the center point, 2″ down in the back, 4″ down in the front, and add a keyhole slit. This gives a lopsided oval effect with a shorter back than front, which is essential for comfort, but it’s just too wide around the neck. My husband’s head is 26″, his neck is 17″. He’s not a jacked guy, but he’s tall and broad, so making garb that doesn’t choke him has been a challenge. Here is my new hack: Neckline gauges. A true circle with the circumference of our necklines (13.5″ for me, 17″ for him), marked up showing increments of 1/2″ from the back toward the center mark. Ignore where it says “+ allowance”, I tried that and it made it too big. Just go with the regular neck measurement, the hem or facing will take care of that ease. You place the gauge on the fabric, center mark matching to the dead center of where you want the neckline to be. Then, move it forward to where you want the depth of the back to be. I’ve done both 1″ and 1.5″ with good results. The dotted line helps you maintain the angle toward the front, and where you can mark your slit. White on white was a horrible idea, but let’s pretend that fold in the scrap is our shoulder seam or fold. Place the gauge on the fabric, matching center points. Move it forward to how deep you want the neck to be. In this case, I’m leaving 1″ in the back, so I’m putting my 1″ mark over the center mark. Give that a shot. Practice on a scrap and put it over your head. You should have a neckline that comes right up if not a bit above the clavicle, and looks more accurate. Voila!! Clearly, a closed slit is vital to the tight necks in Byzantine artwork, but you never see the slit! What do we do? We cover it, or move it to the side. I’ve constructed this for my husband with great results, both with, and without the band collar. This is also where I learned to NOT ADD A SEAM ALLOWANCE ON THE NECKLINE. I’ll be posting a better walkthrough once I’m done with his new collection of tunics so I can discuss my experience using the pattern above. The other option is to put the slit off-center. The most common is just down the left side of the neck, as seen in the Alb of the Holy Roman Empire, and the Palermo Tunicella. 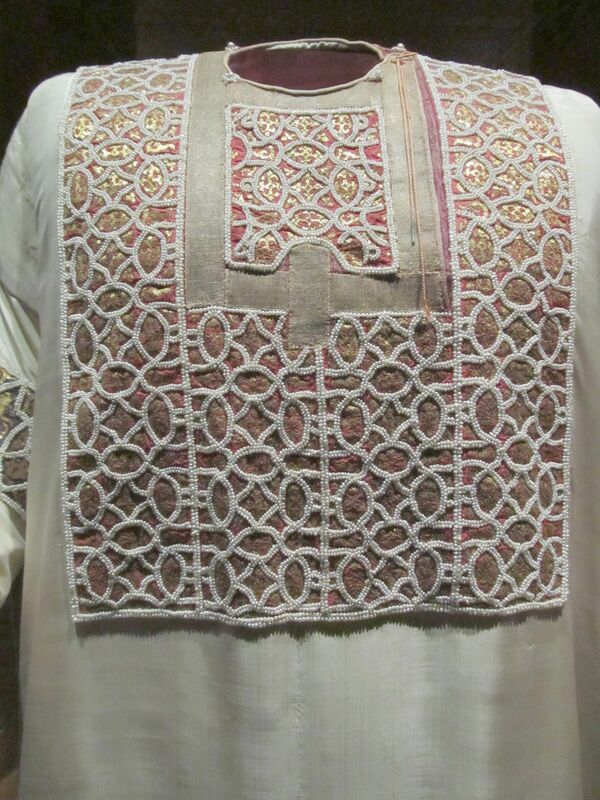 While both not “Byzantine” garments, the Eastern influence is evident. The Coronation Alb of the Holy Roman Empire. The left slit is closed with fingerloop braid. Click on this to see the larger image, it’s worth it. The Palermo Tunicella, with the deep slit off left on the neckline, surrounded by a band of brocaded trim. Another option is to use the shoulder seam as the slit. You see that in the Met Tunic I have posted on (link), and I emulated that for my 12th Century Ensemble (link). So the next time you’re at a loss, looking at source artwork and wondering why your necks don’t look right, give this idea a shot and try a variation for a new fit. I know I’ve been totally converted.